Frustration. Toleration. Acceptance. Gratitude. Love. Freedom. Traveling the journey to greater peace and gratitude one photo at a time. These past 4 weeks Brene Brown’s Course “The Gifts of Imperfection” have been nothing short of life changing saving for me. Thank you Oprah for having her create this course for me! Being a perfectionist, by nature I presume, is not easy. I have put a lot of pressure on myself, and others, to keep everything running smoothly, and neatly…and that’s not easy with three kids, a husband and a plethora of pets! In 2010 I had the epiphany moment that it was okay if my house wasn’t perfect, which is part of the story of how Ride the Wave: Journey to Peaceful Living was born. A constant source of tension was released, which was huge for me and my family. That may seem like a simple realization, but for a perfectionist, being able to live without stressing while some dirty dishes lie dormant in the sink is nothing short of miraculous. Well as all journeys begin with excitement and mystery it continues on to this day with revelation after revelation, setback after setback. I’ve certainly had my highs and my lows. But you see the honest truth is I’ve been struggling lately. Even having accomplished so much and having launched my first big conference just 2 months ago, I had fallen into a slump. Have you ever felt that way? Like, when is enough enough? How much more do I have to DO to prove to myself that I’ve done a good job? It’s flat out exhausting! So in my job as a life coach I wear the hat of a teacher most often, but I needed some time to be taught and I signed up for the course, not really expecting anything supernatural, but thank God for the unexpected. The commitment to stick with it and keep going on this path to teaching moms how to be the best they can be has been renewed over these past few weeks. As I sit here typing this now I feel a great sense of joy. 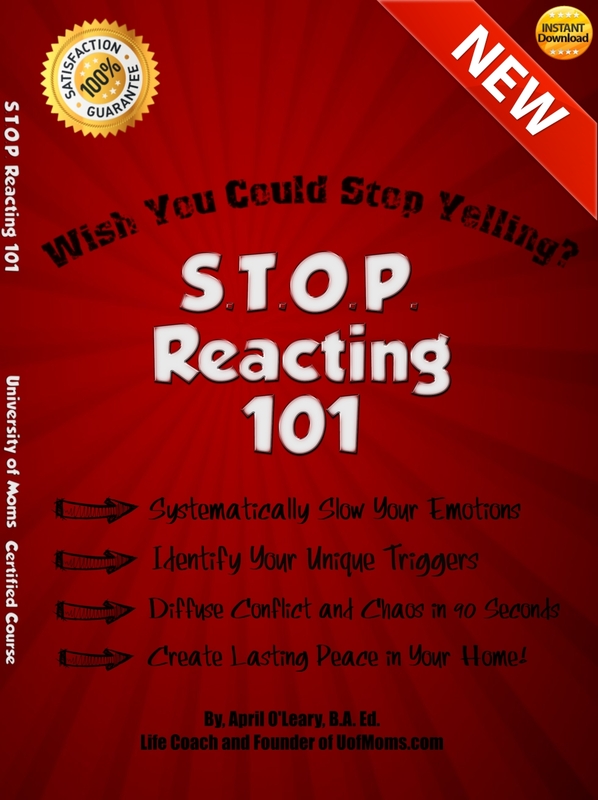 Back to the story…my house had become a ‘toleration’ and so had my business. They were both something that I put up with (albeit peacefully) but in the back of my mind there would come a point where I needed it fixed. Whether that meant cleaning up messes at home or ramping up my programs online I had to jump into action to make it ‘right’ again. Be the best in every area. So after completing the first 3 weeks of assignments which included making a list of things I am giving myself permission to do (or not do) during the class…for me one of them was permission to cry…finding a picture of me when I was at my most authentic, and also my most awkward and then recognizing my trigger points, how I numb myself when I’m triggered and what brings me true comfort, I thought I was home free. They were fun and revealing exercises, but nothing too heart-wrenching. Enter week 4. Gratitude. Now to say this was orchestrated by the greater powers that be is an understatement. Two months ago I was booked to speak to a group on the power of forgiveness and gratitude THIS WEEK and what is this week’s lesson? Gratitude. Assignment: Get behind your camera and take pictures of the everyday things you’re grateful for. Easy enough…or not. I was home one morning and decided to tackle the task. I walked around the house with my iPhone and started snapping. A pile of shoes in the closet brought a tear to my eye. A sign taped to Sadie’s bedroom mirror “Disney Imagineer at Work” stuck out amongst her unmade bed and messy floor, Molly’s miniature drum set sat atop her neatly arranged desk overlook her trampoline, the one she begged us for last Christmas, and Amy’s self-portraits from kindergarten. My how time flies. Her progress shown right there hanging proudly on her magnetic dry erase board. As I sat down at my computer to review my photo shoot, I took one last shot. This is my life. Me. My yoga pants. Working. My computer. On the kitchen table. With Monty at my foot. How these moments slip by so quickly unnoticed. I began crying. I mean really crying. It felt weird. I wanted to stop it, but I remembered my permission slip, so I went there. No one was home, the kids had gone off to school and Jim was at work. I felt my heart that had been so productive and focused and goal-oriented for the past 3 years crack open to a new sensitivity. The tears were running down my cheeks and I let it all out. Recognizing that what really matters is the mess. My girls who are growing so quickly. My husband who is so relaxed that a messy pile of shoes wouldn’t even register on his radar. And my freedom to be able to work from home, pursue my passion to help moms live happy and fulfilling lives and still be present for my kids. This is what I’m grateful for. I’m not tolerating my life, the messes, the to-do list, I am grateful for it. It means that there are people around me who need meals cooked for them, it means the girls have permission to be themselves without the pressure to perform to my preference of perfection, it means I can embrace my hubby without thinking about the pile of shoes that need straightening. That is true freedom. So I challenge you to look at what you are tolerating and see if you can embrace it. Stop just accepting life as it comes, be grateful for each and every moment no matter how small. Gratitude for the small things brings love, freedom and a new appreciation for whom and what surrounds you. With Thanksgiving just a few days away take a minute to snap a few of your own photos to mark this precious and fleeting time in your life and see how that brings new perspective on the ordinary, messy and often overlooked moments. I bet a tear will come to your eye too. Post a comment below to tell me about your Gratitude Photo Experiment. I’d love to hear it! April O’Leary, B.A. Ed. 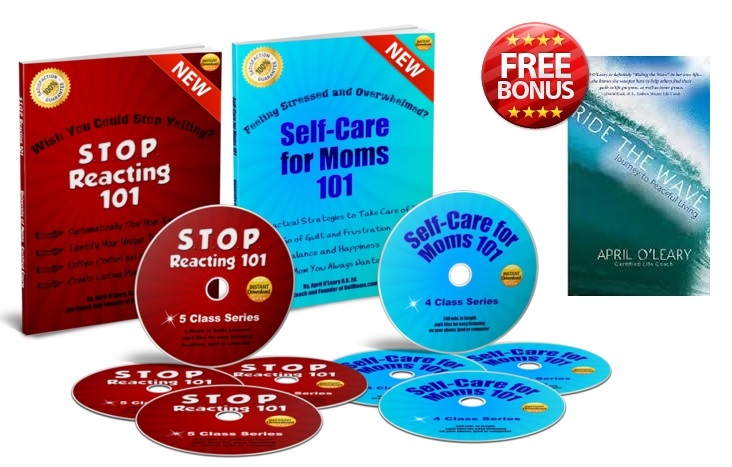 is a Certified Master Life Coach and founder of the University of Moms. She is the author of two books: Ride the Wave: Journey To Peaceful Living and Focus on You: Your Needs Matter Too. She happily resides in Southwest Florida with her husband and three daughters. The air is finally cooling off a little bit here in Florida. How about you? Are you enjoying the change of seasons? But despite the break from the hot summer sun, the holiday season can be a tough one for moms. Not only are we busier than ever, but the pressure to make everyone else happy is heightened and it can leave us lacking for time, energy and patience.Although we all desire a ‘picture perfect’ family (and are eager to send cards showing everyone our happiness), behind closed doors we might be a little more stressed than we allow others (except our children) to see.So if you are feeling overwhelmed, if you are dreading the next few months or if you just want to find a better way to not only cope, but breeze through this time of year with a smile on your face, then you are reading the right email! Give yourself the gift of education. Our two University of Moms signature courses, led by me, are about to launch LIVE in just a few weeks. 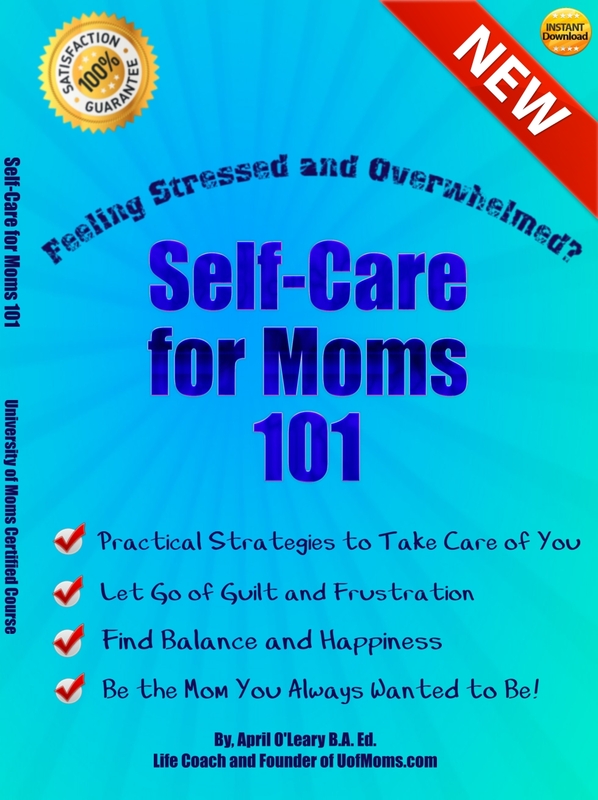 They are aptly named Self-Care for Moms 101 and STOP Reacting 101 and in them I share the nitty gritty details of how I went from a stressed-out and unhappy mom (who yelled a lot) to a mom who is now calm, happy and patient. Each course is 4 weeks long and costs only $39. Or take both classes for just $69 and get my book Ride the Wave: Journey to Peaceful Living free! Click the images below to read the course descriptions. So skip the new shoes or the monthly pedicure and invest in yourself. Learn something new and then do something different and I guarantee you WILL get different results. Like more peace in your house, less stress and rushing and a richer, deeper appreciation for yourself as a mother and a woman.If you can’t join us at the LIVE times as posted don’t worry. The classes will be recorded and provided to you each week by email so you can listen in when it works best for you. All live class options include a private Facebook group for support (optional) where you can ask questions and meet new mommy friends too.For the small amount of time and money required to participate, you will reap great rewards that will make your life happier. You’re children will learn, from you, how to be proactive in life, not a victim, they’ll learn how to find constructive solutions to life’s challenges and how to manage their emotions with ease. All of this is possible…and more! How do I know? Because my house is DIFFERENT than it was just 5 years ago. It’s quiet. It’s not stressful. We look for answers together instead of pointing fingers at one another…and best of all I know how important it is to take charge of my own happiness. I’m not waiting around anymore for someone else to give it to me. That is why I can honestly say…JOIN ME. Let me show you how you can have all this too. As always much love today and always. Here’s to your peace. Your happiness. Your family. Let it be a pillar for others to admire…all because you created it to be. Co-Author of Focus on You: Your Needs Matter Too! What makes a marriage successful? Why is it so difficult to keep your marriage strong when you have children? Well, for starters, when was the last time you had a chance to sit down and actually talk to your partner….uninterrupted?! Most of us know we want a happy marriage, but balancing an adult relationship with the demands children bring can be quite difficult in the ‘real world’. This Monday, August 6th at 12pm EST/ 9am PST I’m happy to introduce Drs. Charles and Elizabeth Schmitz, America’s #1 Love and Marriage Experts to you LIVE as we kick off Motivate Your Monday, Mom! and they share 5 Tips to Strengthen Your Marriage While Nurturing Your Children. CLICK HERE to view the event. As a bit of background: Drs. Charles and Elizabeth Schmitz are renowned love and marriage experts and multiple award-winning authors. As “The Official Guides To Marriage” for www.SelfGrowth.com, the top self-help website in the world, and Marriage Experts for www.PsychologyToday.com and Marriage Advice Examiners for www.Examiner.com, they provide inspiration and guidance to readers around the globe. Affectionately dubbed “America’s Love Birds” by their clients, fans, and workshop participants, Drs. Charles and Elizabeth Schmitz know that simple things matter in relationships. They understand what makes relationships work because they have conducted three decades of research on successful marriages on six continents of the world, as well as sharing personal experience drawn from their own 45-year marriage. Together, the Schmitz’s have written multiple award-winning and best-selling books, as well as being popular speakers and talk show guests. Their latest book, Building a Love That Lasts, provides surprising insights on creating successful relationships (Published by Jossey-Bass/Wiley). We will be discussing their book as well. Click the book or the link above to view it on Amazon. For even more info visit their website at www.simplethingsmatter.com. So go ahead and join us, MONDAY, AUGUST 6th at 12pm EST/ 9am PST LIVE by webcast, phone or Skype. CLICK HERE to view the event and remember to mark your calendar to return on Monday. Come with your questions too which you can submit online or raise your virtual hand to ask them. If you can’t come live, register as a member at uofmoms.com FREE and you’ll get the recording via email after the event occurs. The recording is for members-only. Welcome Drs. Charles and Elizabeth Schmitz!